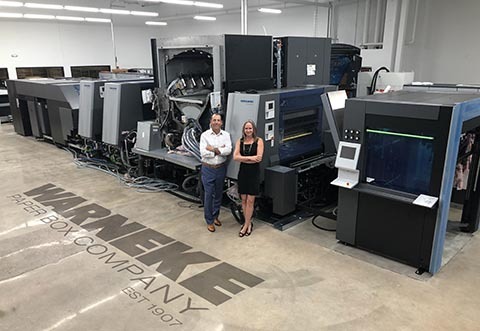 Kennesaw, Ga. – Warneke Paper Box of Denver, Colorado recently began installation of the new Heidelberg Primefire 106. The 7-color industrial inkjet 40” B1 size digital press will allow the packaging printer to expand their business by collaborating with their customers on targeted short run packaging campaigns and provide added security to cartons through variable content. Being the first commercially available industrial inkjet digital printing system in the 70 x 100 (40”) format, the Primefire 106 is designed for high production volumes. Based on the platform of the Heidelberg Speedmaster XL 106, the machine gives packaging printers the confidence of over 80% available print uptime, while also integrating seamlessly into offset environments. With its ability to match offset print quality, the Primefire gives Warneke the option of whether to print digitally or offset based on job length. The Primefire’s direct to sheet 7-color imaging registration even allows for unique security printing features to be incorporated, along with variable content, for anti-counterfeiting packaging designs. After being a beta site for many other Heidelberg products, Warneke knew that they could trust Heidelberg to produce reliable groundbreaking technology that will provide an immediate return to their business. Left to right: Steve Huppert, Vice President and COO of Warneke Paper Box and Stacy Warneke, President and CEO of Warneke Paper Box.